The Democratic presidential hopeful spoke to the Rev. Al Sharpton's National Action Network gathering in New York. 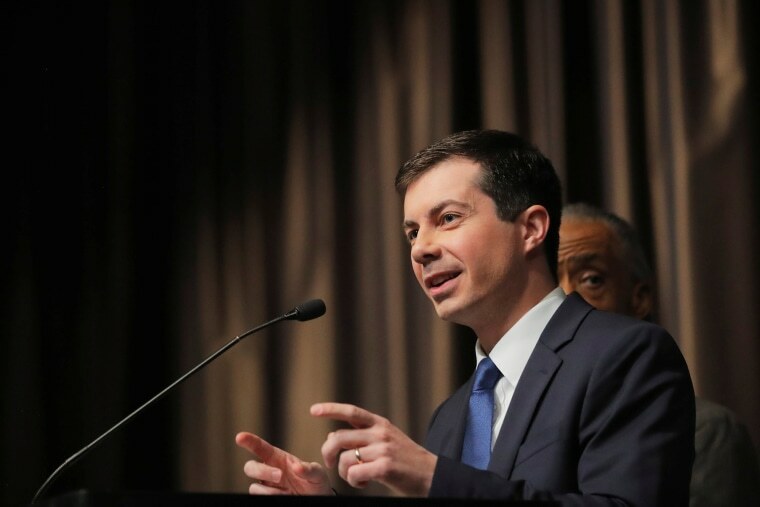 Pete Buttigieg, the mayor of South Bend, Indiana, and upstart Democratic presidential hopeful, on Thursday expressed regret over using the politically charged term "all lives matter" in 2015, explaining that he didn't understand it was coined to "devalue" the Black Lives Matter movement. "What I did not understand at that time was that phrase ... was coming to be used as a sort of counter-slogan to Black Lives Matter," Buttigieg said after a speech at the Rev. Al Sharpton's National Action Network's annual convention in New York City. In March 2015, during a State of the City speech in South Bend, Buttigieg was discussing race and policing issues, calling on his city to "begin talking about racial reconciliation." "All lives matter" sprouted up on Twitter and at political rallies as a hashtag and slogan used by critics of Black Lives Matter to counter the movement's cause of ending police brutality and systemic discrimination against African-Americans. President Donald Trump used the "all lives matter" phrase frequently during the 2016 presidential campaign. Hillary Clinton once used it as well, in 2015, earning fierce blowback from progressives.